The report, “Feed Palatability Enhancers & Modifiers Market by Type (Natural and Synthetic), by Livestock (Swine, Poultry, Cattle, Pets, Aquaculture, and Others) - Global Trends & Forecasts to 2019”, defines and segments the feed palatability enhancers & modifiers market with an analysis and projection of the market size, in terms of value, of types of feed flavors, sweeteners, and text rants. Browse 126 market data tables and 20 figures spread through 236 pages and in-depth TOC on "Feed Palatability Enhancers & Modifiers Market by Type (Natural and Synthetic), by Livestock (Swine, Poultry, Cattle, Pets, Aquaculture, and Others) - Global Trends & Forecasts to 2019". The report has also identifies the driving and restraining factors for the global market with analyses of trends, opportunities, winning imperatives, and challenges. 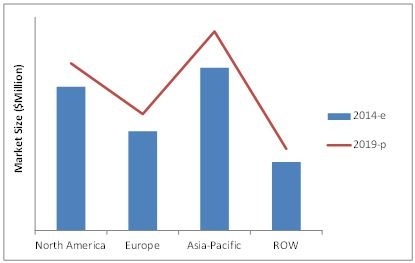 The market is segmented and values are projected on the basis of the main regions such as North America, Europe, Asia-Pacific (APAC), and Rest of the World (ROW). The key countries are covered for each region and their market trends are studied. The Feed Palatability Enhancers & Modifiers Market was valued at $2,577.8 Million in 2013 and is projected to grow at a CAGR of 3.5% from 2014 to 2019. In 2014, Asia-Pacific is estimated to lead the global market with the highest share, followed by North America and Europe, in terms of value. Flavors are feed additives that are used to enhance taste of the feed to stimulate intake. Along with the taste, flavors also enhance the smell of the food product; the aroma being a primary factor behind the preference of the feed. The flavors also mask the unpleasant taste of the feed, which might result from adding other feed additives for medicinal purposes. Sweeteners are products used to sweeten the feed and are used as a substitute for sugar. Texture is the surface of the material perceived by the sense of touch. The mouth feel, enhanced by texturants, is another prime factor that encourages the feed to be preferred. The report also covers various other important aspects of the market. It includes an analysis of the competitive landscape. In addition, the ten leading players of this market have also been profiled.